Amy Sherman writes in her Epicurious Blog this week about cookbooks and books for cooks this holiday season. But read here about Cooking the Books for real (thanks to Joseph! )- then go read Amy's blog about new Cookbooks and the cooking a whole cookbook trend. You may have heard about the Julie/Julia project? That was the one that launched a career, I think. Then there's Smitten Kitchen, if memory serves, she's working her way through Dorie Greenspan or Maida Heatter. Anyway, all are worth checking out. As are a few I cover in my new post on Suite101. I am so excited to tell you about a terrific gift idea. You know how I love the ocean, our fishy friends, penguins, sustainable seafood...did you know I once taught a half dozen kids under the age of 8 to bake bread? The best was when one girl asked me on her way out the door..."what's this called again? I want to remember so I can ask Mommy to buy it..." It was whole wheat bread. No lie. So if you know any kids (even really big ones like me!) 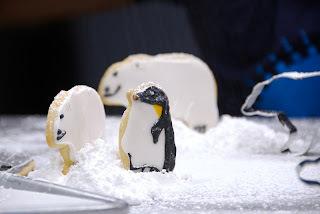 who might like to bake cookies, here's a great idea from our friends at Oceana in collaboration with CakeLove. You know CakeLove, don't you? A fellow refugee from the law, Warren Brown's success story should be required reading for every pre-law student out there. "Do you really love law? Really? As much as you love fill-in-the-blank. Ask yourself what you want to be doing 80 hours a week for the next long while." For Warren, it was baking. (How cute is he?) Well, we're all luckier for Warren's love of cake and his courage to follow that love to where he is today. Our friends at Oceana and all the others they protect are lucky, too. Go Ahead Dive in and Eat a Cookie and Save the Oceans. I know a little niece who loves cooking with her "Mo-Mo" ...this might be on our holiday agenda..
Find out more by going to either CakeLove or Oceana. I often write late at night, glass of wine nearby, listening to NPR through a headset while the other residents of the loft sleep nearby. Usually, it's Marian McPartland's Piano Jazz I listen to, sometimes other podcasts make the playlist. The other night one of these blurbs caught my eye: Umami was once again in the news. I'd recently tried the quick marinara sauce offered by Chef Silvia Bianco which incorporates one umami-rich anchovy for simmered-all-day flavor. So, I guess I had umami on the brain. Then, on Robert Krulwich's Science segment, I learned about Jonah Lehrer's book: Proust was a Neuroscientist on NPR on just one of these nights. Lehrer is an anomaly in today's world of specialization. Not "just" a scientist, he read Proust in the lab awaiting his experiments' transition from one stage to another. In his (unnaturally bifurcated) world of science and literature he had an epiphany: the world of literature and science is one world. It is not an "either-or" proposition. This got him thinking and we are the lucky recipients of this book, the results of a thinker (both a scientist and a lover of literature) who refused to submit to conventional thinking. Lehrer uses Proust, Walt Whitman, George Eliot, Paul Cezanne, Igor Stravinsky, Gertrude Stein, Virginia Wolf and August Escoffier to illustrate thinkers from various artistic disciplines who learned a truth that the science of their time denied. Over my annual Orphans' Thanksgiving I was sharing with friends I've known for un f* -believable numbers of years some of my new writing projects including one in sports and one in film. Joe looked at me and said "You know, that's an incredibly unusual combination of things you write about." To which I replied, "Yes, I'm just an incredibly unusual kinda girl." We all laughed, as you can with friends who know you that well, that long. And I am. Incredibly unusual, that is. It's just taken me all these years to figure out it's not me that's off. Too many times I've been the "square peg" gamely playing at "round hole." It's never been fun trying to convince others I was okay. If they lacked the capacity to comprehend a feminist might also wears eyeliner, or that a girl who cooks also likes football, why was it my fault? I was a lawyer comparing myself to Proust or Whitman in terms of any talent, just in terms of the certainty that I do not fit conventional molds. Another friend who joined us is my "little sister" whom I began mentoring when she was 10. Now she's an amazing, level-headed, fun and caring young woman of 27 years. I heard a piece on Billie Holiday, one on Johnny Hartman, another with Diana Krall and Marian McPartland. All of these but McPartland are musicians I've loved for years, I'm glad I've 'discovered' Marian now. I was struck by the fact that Holiday, Hartman and Krall all said they were unable to sing songs that they didn't feel were reflective of them and how they feel. Constitutionally unable and unwilling. This was a another brilliant reminder of the importance of being your authentic self. In just a few segments I've heard, it's an aspect McPartland appreciates in those she interviews and plays with, too. Now, at this wonderful holiday, my favorite, I realize how lucky I am to have friends who are really great, smart, funny and steadfast friends. They don't care if I don't fit some conventional standard. They don't care if I don't fit my clothes from last year. They celebrate all of who I am - right here and now. I am a very lucky (if slightly rounder, slightly older) girl. Authentically me, and at last unapologetic about it. Speaking of celebrating, how about the menu this year? What worked well for you this year? Did you start or continue any traditions? Try any new recipes? One thing new I did this year was to make dinner rolls with pumpkin. They were not like sweet muffins, just beautiful pumpkin-colored dinner rolls. And they made a delicious bread pudding today. I also used this new thing I found called a roasting wand. It heats the stuffing inside the turkey so you eliminate the problem of overcooked bird for well-cooked stuffing. I made some stock from turkey wings the day before. Simple to do and well worth the extra flavor dimension. The new touches will make a reappearance at next year's Procrastinators', Refugees, and Orphans' Thanksgiving. Note to self: get some more good jazz too. I'm grateful for the riches of the table, good friends, good health, a terrific husband. An unconventional life that is wholly mine, and full of thanksgiving. In the ocean it's called dredging. In the blogosphere it's called "scraping" and "splogs" do it. Someone writes some code, they troll the Internet and find blogs or posts with good traffic, then they scrape your content and use it to collect ad revenue. My blog has been scraped and the bottom-dwellers have set up a fake blog (doh!) with my copyrighted content in an attempt to collect ad revenue from people clicking on the ads there. People might do a Google search and find my content on the fake blog and click on ads there. Those of you who read me here need not worry. You'll notice I have very little, unobtrusive ads here. I haven't seen any evidence that the pitiful revenue outweighs the objectionable clutter. But then, I'm not scraping content from all over. A couple of clicks here and there and for one piece of code, some a*hole is making money from my content. Good News Still Coming on "Teach a Man to Fish"
I suppose the good news is that it means our sustainable seafood event was successful and caught attention from high and low. We covered the low, now let's look at some of the good news. The Monterey Bay Aquarium's new SeaNotes Blog mentions us as some good news amongst the bad news of the spill in San Francisco. The effort also got recognized by Internet Research and Strategy Gurus Sea Change Strategies in this interesting post, Be Remarkable and They Will Come. I am flattered to be so described by this group. I never thought "doing good" was an option, either Mark. 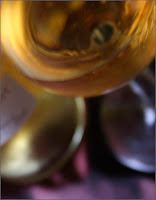 Andrew has a terrific wine site, a fabu foodies blog and more. Really terrific design, top-notch content and he's a good guy to boot. Please check out Spittoon "We spit so you can swallow..." Oh, and Andrew's got beautiful photography throughout his sites, this photo above is his. Gorgeous. A huge supplier of King Crab legs is arrested. Arkadi Gontmakher a Ukranian living a lavish lifestyle in Seattle is accused of large-scale poaching and more. Currently, most of the king crab in the retail stores is from Russia, his company has been the chief supplier. In the first six months of this year, according to the Seattle Times, Gontmakher brought 20 million pounds of crab into the US - roughly equal to a year's legal harvest in Alaska. The Russian crab is in stores such as CostCo and Safeway across the country. Be sure to insist that your supplier is buying from Alaska, not Russia.The U.S. red-king harvest is under way and American crabbers are hoping for a new marketing peg that will emphasize the U.S. conservation rules to prevent overfishing. Click here for more info on how to choose responsible sources for crab. Read here for more info, and quite a drama to boot - money laundering, Russian politics, mansions, cars, veiled threats - this story has it all. It's almost time for my morning coffee (usually about your lunchtime) but I'm powering through getting one more thought down..."on paper" as we used to say. I'm thinking about the skit on some old SNL show with Farrell & Oteri as morning talk show hosts like Regis and fill-in-the-blank-blonde-du-jour....I believe the skit was called Morning Latte. The talking heads' monitor goes out and they go from preternaturally chipper and overly enthusiastic to savages. Lord of the Flies-style. Completely unglued because "the words have gone away....why, why - why have they gone away?!" I think they even try burning sacrifices, desperately hoping to "bring back the words, bring back the words..."
Well, those of you who know me, may have a notion where this is leading..
As I struggle to make a living as a freelance writer (part of the explanation for my absence here the last few days) I laugh about the "stars" who cannot get up and do a show - even if it's a talk show - w/o the writers to give them words. We value the celebrity, but forget that the entertainers are not the clever people that make us laugh, they are (for the most part) the ventriloquists' dolls. The words come from someone else. Below the Line - is an industry term for all the folks employed in trades related to the film trade: grips, makeup, cleaners, trailer and storage rentals, think of the tons of people who are out of work by choice or by layoff. As the studios spin their message: "We don't know about this scary new world of the Internet, who can tell how to calculate profits? how to divide them? we need a study!" Take a look at t his video - pretty disgusting when you think of the main arguments put forth by the studios about why they can't pay writers a share of new media profits. 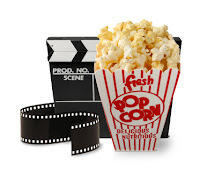 If you want to see some "person on the street" quotes (maybe yours) and get a peek inside The Business of the Movies, check out one of my new gigs. Click here: BoxOffice.com On the Street. Or you can see my by-line on the new Sidney Lumet movie, Before the Devil Knows You're Dead, click here. Truthfully, I'm not sure but I think we're supposed to be boycotting movies right now. I've also begun a sports blog The Sixteenth Minute - and have some interesting related projects cooking (so's to speak) in that arena. Stay tuned for those. Take a look and drop a comment letting me know what you think. On the way to see Sweeney Todd, we had dinner at Troquet. I asked for the Sweeney Todd Pot Pie special, it got a laugh...and dinner was great. More soon on that, but short word is this: familiar dishes executed really really well with just enough imagination that no one will be scared. Enthusiastic staff and terrific food, great wine list. I'm going to go back for a wine/cheese flight and will report more, hopefully soon. Another great meal with friends we brought to Gourmet Dumpling. If you missed my earlier exhortation: GO. See "Eats, Shoots, Leaves." y que mas....what else you ask? What will you see when I bring back the words? I've been working on a travel/restaurant guide comparison piece; holiday pieces; how to do a cheese plate; beer tasting; kitchen appliance innovations; phew...just too much on my plate. That, for a writer, is a good problem to have. The Ryan Newman Foundation, which was awarded $10,000 from the Catfish Institute for winning the NASCAR Cook-off, does a lot of great work to help animals. Anyone interested in learning more about catfish can visit The Catfish Institute. To find a restaurant nearby serving catfish, click here. Ryan Newman's Catfish recipe was one of the first entries in our "Teach a Man to Fish" Sustainble Seafood Event. In a medium bowl, combine flour, cornstarch, Cajun seasoning, garlic powder, Everglades seasoning (if using), baking powder, paprika, white and red peppers and oregano. If not using Everglade seasoning, add 1/2 teaspoon salt. Whisk in beer and egg until smooth. Cover and refrigerate for 1 to 2 hours. When ready to cook: In a deep skillet or large pan, pour vegetable oil to the depth of 3 inches; heat to 375°F. Stir batter and fold in catfish. When oil is hot, lift fish strips with tongs, draining excess batter; place catfish in oil several pieces at a time (do not over crowd). Fry until well browned on all sides, about 3 minutes. Remove to paper towels to drain. Keep warm, repeat with remaining catfish. Patriots Win - NBC Loses - It's a Rout! They explained the network is committed to "being green" and this move would "save as much energy as it would cost to heat an average home for a month." So what if you guys did every show in the dark? Maybe if you didn't do a show at all? What if you guys took public trans to your studio instead of limos? What if you didn't send Matt Lauer (cue the shot: ridiculous parka next to an igloo) TO THE ARCTIC? Hello --- can you say carbon footprint? How many dark football shows will I have to endure to off-set that trip? So stoopid. Cut to Madden and Buck: laughing about the Eagles owners and how "green" they are since they bought the team franchise for a few hundred thousand and it's now worth bazillions..."yeah, heh heh heh, they're really green now, Joe." Res ipsa loquitur - as we say in law. The thing speaks for itself. Yes, we've got "massive potential for growth." That was the phrase an old boyfriend used each time he screwed up royally, that was supposed to be the reason I'd hang in there with him. I discovered a new site tonight: EarthLab. Mario Battali (whose new book title reminds me of a constipation cure) provides some recipes, they show him zipping around on his Vespa, and, of course, he hawks his wares. I think buying more stuff is kinda not what we should be doing for the planet. Anyway, there might be some good useful stuff there. We'll see - at least the lasagna looks good. I guess if Mario's recommending Italian wine on his Earthlab column, I don't have to worry about the Locavores scolding me, right? Up to my gills in sustainable seafood lately, as you know. It's been grand, but sometimes a girl just needs a steak. Welcome to the neighborhood, Morton's. In a grand fashion, Morton's hosted benefit for the Boston Public Market as well as a soft opening for the newest Morton's restaurant. Smaht as we say here in Boston, wicked smaht. The food was plentiful and fabulous. Servers were eager to serve. Wine was almost always in reach and I made friends with the man at the oyster station. Mais, bien sÛr. Of course we made reservations for dinner the very next night. And was it good. One of the hallmarks of a good steakhouse is whether they can make a perfect martini. Check. Hendrick's, but no cucumber slice. Then, do you get gracious service? Check. Fabulous, aged steaks? Check. Beautifully prepared sides? Potatoes, of course. Garlicky fresh, crisp green beans. Check. Check. Check. By the time we got our check, I was fairly glowing, happy girl, doggie bag in hand. Nothing like a little (prime-aged ribeye) steak and eggs for breakfast. For Susan in Italy this article mentions a new sustainable seafood label in Italian markets. The Sustainable Seafood Blog Event is done. As we end this adventure, the new one begins: making all these great dishes. Huge Thanks to all who participated in this event. To call it a success would be an understatement. In just two weeks, I received a boat-load of great recipes. From elaborate to quick; gourmet to home-style; from near and far. They all look terrific. Our catch includes over two dozen recipes, including two videos. Entries came from big fish to small fry - highly acclaimed chefs, an author, home cooks, and food bloggers, like me. We're all learning. (Can I push it further and say we're in school?) As Chef Barton Seaver explains, it's a dynamic area. Some fish stocks have come back from being nearly depleted, like abalone. Others are still in danger, such as Chilean Seabass. I particularly appreciated the readers who shared their own “sustainable seafood 101” stories with us on their blogs. I know you will enjoy them, too. And speaking of 101, two fellow writers on Suite101 shared their recipes and knowledge, too. Links are included to other resources, and recipes down below. I've organized this alphabetically, by main ingredient, beginning with Abalone from Chef Pahk of the Silverado Resort in Napa Valley. For each recipe submitted, I have included a brief intro to the main ingredient from the Monterey Bay Aquarium Seafood Watch pages. I have included a live link to the item's profile there. Scroll over, click - there you are. I have also included live links to each participant's blog or website. In a couple of cases where the recipe was not hosted elsewhere, I have posted it on my blog here and included a live link to that post. Most of all: share these recipes and what you've learned with your fishmonger, your family, your friends. Pairings from our beverage board. (What, you thought I'd let you go thirsty?) Subscribe to a feed or sign up for my newsletter (see sidebar) for updates. Beer, wine, sake, tequila...what will they recommend? Abalone farming has helped to reduce damage to the wild population off the West coast of the US. Executive Chef of the Silverado Resort sent us this beautiful recipe made with Cayuga Farms' Abalone. This recipe is an elegant example of his skill and it's also a success story, of sorts. Abalone was nearly fished to extinction. We may have learned, just in time, how to responsibly manage the abalone populations. Mahalo, Chef! Calamari or Squid is a good choice and jumbo squid may be the best choice. Jumbo squid are line-caught so little damage occurs through by-catch. Little is known about their overall populations so the more common squid may be the better choice. Chef Silvia Bianco of Food411 shares her recipe for this calamari with pine nuts and tomatoes. She also offers three other recipes from her book Simply Sauté. (Seafood Risotto, Salmon with Wild Mushrooms, and Tilapia Pomodoro) Please find the recipes here. U.S.-farmed catfish is a best choice because it’s farmed in an ecologically responsible manner. We have two catfish recipes for you, one by a guy who literally teaches men to fish, among other things. Ryan Newman is a NASCAR driver and seemingly all around good guy. Take a look at his foundation and charitable projects. Normally, I tell overachievers to slow down, because they're making me look bad. But, Ryan's a NASCAR driver, so I guess I'll just have to say "thank you!" Janet Gresham of the blog Catfish Bytes sends us this sweet and spicy glazed catfish recipe. This has an appealing Asian-style glaze, citrus and red pepper combine in this recipe that will get a green light from your doctor. It looks quick to prepare, too. Might be the answer to "what's for dinner, tonight?" Since Tigerfish is in California, they used the West Coast Seafood Guide. "The manila clams used in this recipe are almost from an entirely farmed-source, categorized under "Best Choices" in the West Coast Guide and the prawns I have bought are USA farmed-prawns also classified as "Good Alternatives" in the guide." This recipe of Clams and Prawns steamed with egg whites looks gorgeous. Pacific Halibut is the best choice where long-lining is the method of harvest. As Halibut are bottom-dwelling fish, other methods result in wasteful by-catch and environmental damage. Wild-caught California or Greenland are also acceptable. Sesame-Crusted Halibut - Dolores sends her post from California, where she writes Chronicles of Culinary Curiosity. I love Dolores' post because she shows how easy it was to make a dish using a smart seafood choice. She reviewed her Seafood Watch Guide, had a brief conversation with her fishmonger, then sat down to a beautiful line-caught Sesame-Crusted Halibut dinner. I'll bet her fishmonger was happy to have an enthusiastic and informed customer, too. Hake, also known as whitefish, is listed as a “good alternative” in our guide. Be sure to purchase Silver, Red and Offshore hake that is wild-caught. This Dalmatian Fish Soup recipe comes to us from Croatia where it's called “mol.” Maninas shares a family soup using “mol.” Looks like a comforting broth and a second course of poached fish. Just grab some good bread. Mussels are cultured throughout most of the world. Cultured mussles account for approximately 90 percent of the world mussel consumption. Major producers: China, Spain, Italy, Thailand, France and New Zealand. The U.S. imports most of its mussels from developed nations with stringent environmental regulations. Mussel-farming methods, similar to oysters', are environmentally sound, do not rely on fishmeal or fish oil. Diseases are rare so antibiotics and chemicals are not necessary. Well-run bivalve aquaculture operations actually benefit the surrounding marine environment. My favorite mussel trick? Use the first empty shells as tweezers to snag the rest of your mussels from their shells...nature's tools. Pepy a.k.a Andaliman, who writes The Art and Science of Food gives us Indonesian Mussels, an exotic Indonesian recipe by way of Canada. This entry includes information about Vancouver's sustainable seafood program and restaurants that participate. We're delighted to have a true leader in the area of sustainable seafood participate. Chef Seaver has won numerous awards and accolades, he offers his recipe for Rockfish and also tips about how we can each make responsible and delicious choices. Here's Chef Barton Seaver's recipe for Seared Chesapeake Rockfish over minted pumpkin and crispy kale. I asked him to share his thoughts. First, he reminds us that sustainability is about flexibility. reevaluate our choices. Sometimes it is necessary to try unfamiliar things, but I have found that this is part of the fun of the dining experience. I choose to source all my produce and fish from small farmers and fishermen because I know how they operate. It takes more work at the beginning, but knowing that I'm serving the best food possible in my restaurant is worth the small investment of time." In addition to the Monterey Bay Aquarium guides, he says, "Anyone can easily choose more sustainable products.... there are a number of consumer guides to help choose the best fish, including Blue Ocean Institute's Guide to Ocean Friendly Seafood." For his restaurant, HookDC, he also tries to source fish that have been Marine Stewardship Council certified. Wild caught Alaska Salmon is the best bet. Look for Coho, Sockeye, King, Pink and Red salmon. Avoid farmed salmon. Did you know Alaska is the first state to have legislated safe and sustainable fishing policy? It can be a challenge to ensure that your salmon is actually wild and not farmed. Be sure you trust your fishmonger. Wild smoked salmon strata comes to us from afar. It looks divine and this blogger probably hides her identity to prevent us all from dropping in for brunch! Check out the Isolated Foodie whose "cooking trials at the far edge of nowhere" are worth a visit, even if only a virtual one. Kathy Maister of StartCooking was first out of the gate with her Cold Salmon with Creamy Mustard Sauce. She's also got two video demos of simple seafood recipes, which, if sourced properly, would make fine sustainable seafood choices. Take a look at Kathy in action making Shrimp Scampi and Scallops. Sardines are a "best choice" as populations are healthy. Sanja claims not to be a cook. Check out her Fresh Adriatic Fish blog. Don't you think the steps, the how-to advice (like how to recognize good, fresh fish) and other little tips on prep reveal a natural at work? Black Rockfish is the best choice. Several fish sold by this name are caught by unsound methods. Look for wild-caught or hook-and-line caught fish by the name of: Black bass, Black rock cod, Sea bass, Black snapper from CA, OR, WA or Wreckfish or black sea bass Atlantic wild-caught. Sabra writes Cookbook Catchall from NY and shares this recipe culled from a book called Culinaria Eurpoean Specialties. There's also a recipe for Romesco sauce to go with the elegant Salt-baked Sea Bream. I saw Chef Seaver prepare a salt-baked fish at the Southern Exposure event in Greenville. It looked easier than I thought...give it a whirl! Shellfish are usually good choices, be sure to consult your favorite guide for advice on shrimp, langoustines or crab. This Brodetto recipe was submitted by Delicious Italy. This is a terrific site I discovered when writing about culinary travel and the home cook or "Cesarini" travel trend. There are four types of brodetto corresponding to the different fishing localities in the region - 'Ancona', 'Porto Recanati', 'Fano' and 'San Benedetto del Tronto'. Like our U.S. fisherman's stew "Cioppino," Brodetto is made with local fish, caught that day but unsold. The fishermen of Le Marche might use squid, crustaceans, langoustines and over 550 species of fish from the Adriatic coast. Even if you can't get to Italy right now, visit the site and you'll fall in amoré. Pink Shrimp from Oregon or Spot Prawns from British Columbia are the best bets when buying shrimp. Trawling is a method used to harvest shrimp from other regions (including Black Tiger Shrimp, Tiger Prawns and White Shrimp) and can cause damage through by-catch or other fish caught in the trawling nets dragged through the water or along the sea floor. Michelle A.K.A. The Greedy Gourmet asks..."Have you ever reached satiety but carried on eating anyway because the food tasted so good? What about hiding dinner leftovers in a “secret corner” in the fridge, hoping no one else in the house will notice, and having a little midnight feast before anyone discovers your booty?" Yes, Michelle. Yes, I have....If I make these Pan-fried Butter & Garlic Prawns, however, I'm sure there will be no leftovers at all. Michelle's a South African in the U.K.
U.S. farmed Tilapia is a best choice. Farming methods in other countries have caused environmental problems both through escapes and pollution, both of which threaten local environments. A Kerala Fish Bake comes to us via Florida. Coconut milk, chili, turmeric, it sounds complex but is promised to be easy. The story that begins with the long journey from India to Florida and from novice to skilled cook is one that many of us can, no doubt, relate to. Olivia Wu of SFGate.com gives straightforward advice about what to ask your fishmonger in this article. Know your source and your fish. Read about diners in Florida who were duped. Timothy Dzurilla shares his paella recipe here. Mary Luz Mejia shares recipes from the Endangered Fish Alliance in her Sustainable Fare. My own collection of S/O/L/E (Sustainable/Organic/Local/Ethical) recipes, articles, news on these topics. Includes: Cockles & Langoustines, Swordfish Provençal, Razor Clams, Ginger-scented Tilapia, and more. Good Gravy - You Can Do It! Holidays are just around the corner...check here for help, recipes, and tips. Don't miss out, keep it fresh! Yes, I want to know what you're writing about. "Like checking in with an old friend..." and "a very persuasive and well written argument..."
Fresh Fruits, Vegetables and More? This is a Flickr badge showing public photos from docscook. Make your own badge here. We've moved - Click Here! There is a communication of more than our bodies when bread is broken and wine is drunk. And that is my answer when people ask me: Why do you write about hunger, and not wars or love. MFK Fisher.